Rous Head, Perth, Western Australia. 25 May 2011. John Huisman. © John Huisman (j.huisman@murdoch.edu.au). 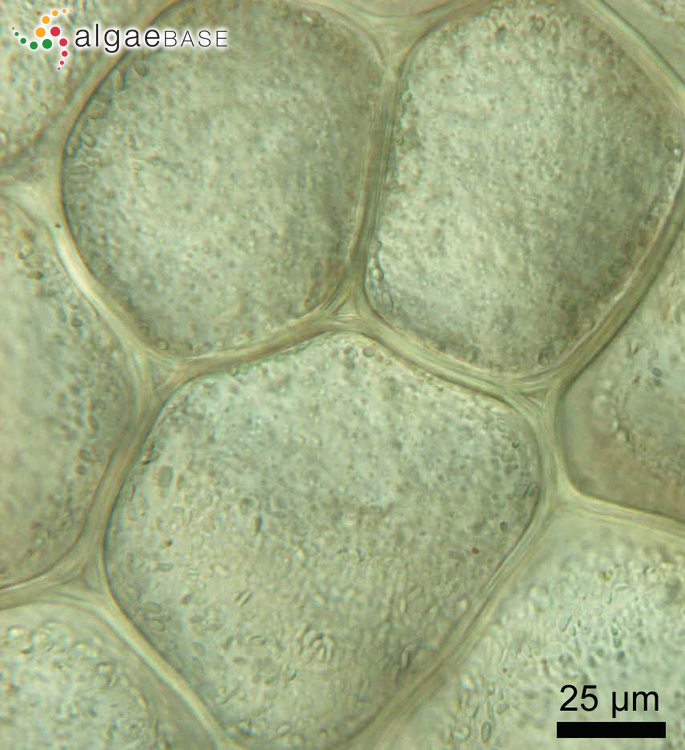 KwaZulu-Natal; detail of surface cells. Heroen Verbruggen. © Heroen Verbruggen (heroen.verbruggen@gmail.com). Published in: Weber-van Bosse, A. (1896). 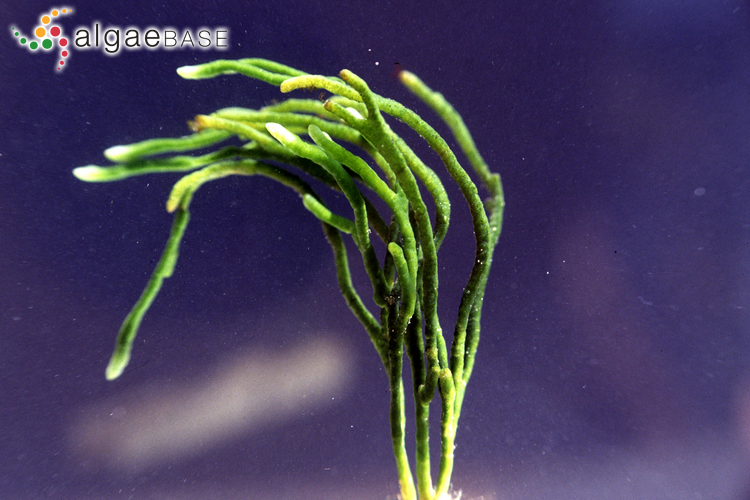 On a new genus of siphonean algae - Pseudocodium. Journal of the Linnean Society of London, Botany 32: 209-212, Plate 1. This is the type species (holotype) of the genus Pseudocodium. 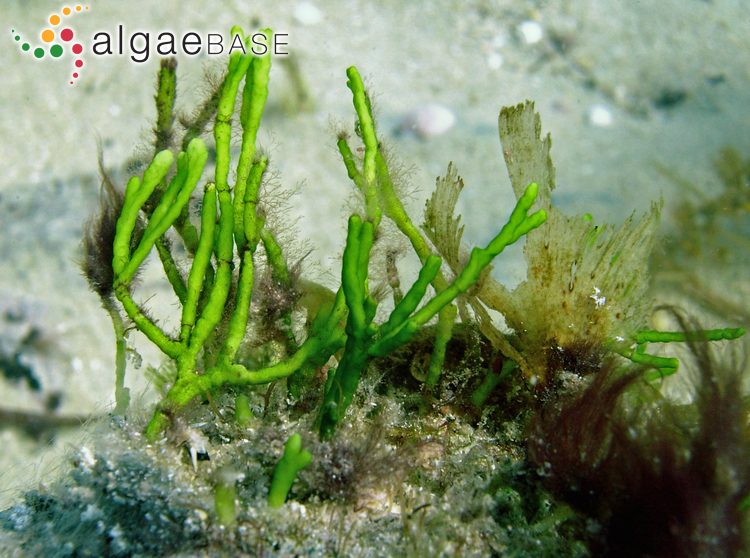 Thallus upright, to 5-8 (-14) cm high, attached to rocks by a feltlike rhizoidal holdfast, bright green in colour (drying darker); axes compressed or subterete and becoming compressed in the lower portions, 0.9-2.5 mm wide and 0.5- 1.0 mm thick, dichotomously branched up to seven times, tapering slightly or not at all toward the apices, often with undulate margins; irregular shallow constrictions of the axes uncommon to prominent; apices truncate with a depressed apical pit. Structure of longitudinally arranged interwoven medullary siphons, 30-50 µm wide, giving rise to a single layer of peripheral utricles; utricles polygonal in surface view, distinctively clavate in transverse section, (50-) 64-76 (-94) mm in diameter and (153-) 161-186 (-200) mm high, with a flat apex, closely laterally adhering along the entire length of their faces; utricle stipe not eccentric, often with a distinctive swelling. Chloroplasts and amyloplasts present in the utricles and siphons. Reproductive structures immersed in the thallus, produced laterally from medullary siphons close to the base of the utricle stipe, ovoid to irregularly shaped, 80-130 µm in diameter. Lower part of the intertidal area, often in tidal pools, as well as in the shallow subtidal area (South Africa, southern Mozambique and the warm temperate part of Madagascar. Confined to the subtidal area (8-15 m depth) in Oman and Western Australia. 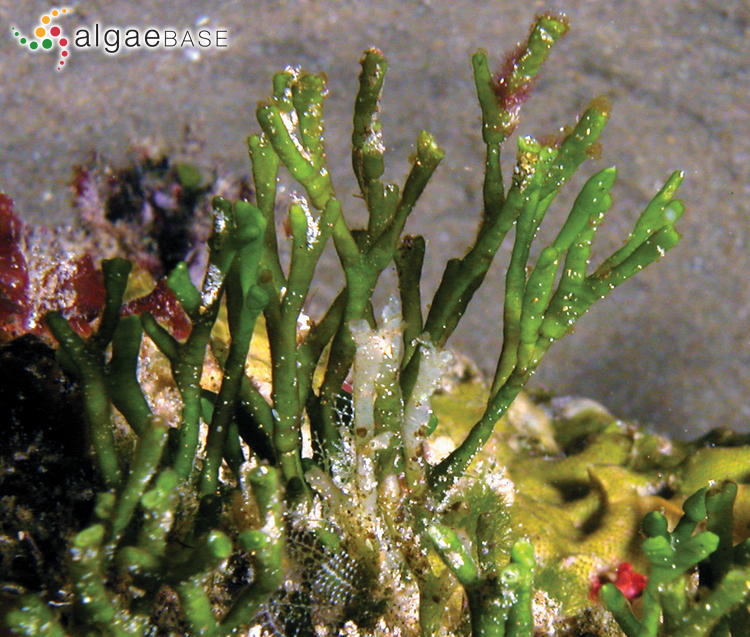 Type locality: Isipingo Beach, near Durban, Kwazulu-Natal, South Africa (De Clerck et al. 2008: 228). Type: Weber van Bosse; 1894-1895; L 936.73-447 (De Clerck et al. 2008: 228). De Clerck, O., Verbruggen, H., Huisman, J.M., Faye, E.J., Leliaert, F., Schils, T. & Coppejans, E. (2008). Systematics and biogeography of the genus Pseudocodium (Bryopsidales, Chlorophyta), including the description of P. natalense sp. nov. from South Africa. Phycologia 47: 225-235. Accesses: This record has been accessed by users 1355 times since it was created.